The uniqueness of women's voices yield opportunities to be heard. Margaretta Noonan of noonanWorks writes about this very subject and also shares research results on how women feel about communicating and what they can do to speak up and share the important things that need to be said. Margaretta Noonan of noonanWorks talks about the DiSC Assessment and how it helped her to have a better understanding of her work style and that of her team members. Since learning about DiSC, she has helped many companies and leaders integrate DiSC into their day-to-day practices to work more effectively with their team members. Learn about how DiSC could help you and your organization. Margaretta Noonan of noonanWorks discusses and entertains us in her latest article about the fallacy of multi-tasking, featured in BIZCATALYST360°. Multi-tasking is often revered as a must-have attribute, but evidence proves that there are disadvantages of performing as a multi-tasker. Tips on Employer Branding: Who do They Think You Are? Margaretta Noonan, founder of noonanWorks, gives insight on the importance of building good employer brand in her latest article featured in, "Enterprising Women" magazine. How can you ensure that your employees are saying good things about your brand as an employer? BizChix.com is a nest for the multi-passionate entrepreneurs. 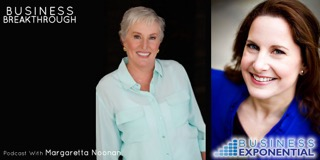 As the site states, “these are chicks who don’t just take their work seriously, but are focused on learning, growing and excelling in numerous areas.” In this post, we invite you to listen to a podcast between Margaretta Noonan, founder of noonanWorks, and the BizChix CEO and host of the podcast, Natalie Eckdahl. In her latest article for “Enterprising Women” magazine, Margaretta Noonan, founder of noonanWorks, writes about engagement and fulfillment for you and your team. Are you all there? The Challenge: A hip media agency in New York City was employing a younger and younger creative team. The HR team, mainly middle-aged professionals, wanted to understand how to better engage with the generation now entering the workforce. Learn how noonanWorks helped. On July 31, Margaretta Noonan, founder of noonanWorks, will be speaking at the 2014 Global Education Summit in Virginia. This three-day event brings professionals together for a meaningful program of educational tracks, lectures and presentations by recognized industry experts focusing on the most important aspects of global diplomacy. The Challenge: A multi-billion dollar retailer wanted to realign its HR function to fit the changing needs of the business. Although the retailer was undergoing a transformation initiative, the HR function wasn’t directly included. How could HR make sure that it was not going to be marginalized, and even better, become a significant part of the transformation? Learn how noonanWorks helped. This is the final post in a series of blog posts with content from “Achieving Success as an HR Executive: Leading HR Executives on Developing a Personal Management Style, Overcoming Challenges, and Understanding Key Business,” a book published in 2008 with contributions by Margaretta Noonan, founder of noonanWorks. This is the eleventh in a series of blog posts with content from “Achieving Success as an HR Executive: Leading HR Executives on Developing a Personal Management Style, Overcoming Challenges, and Understanding Key Business,” a book published in 2008 with contributions by Margaretta Noonan, founder of noonanWorks. This is the tenth in a series of blog posts with content from “Achieving Success as an HR Executive: Leading HR Executives on Developing a Personal Management Style, Overcoming Challenges, and Understanding Key Business,” a book published in 2008 with contributions by Margaretta Noonan, founder of noonanWorks. This is the ninth in a series of blog posts with content from “Achieving Success as an HR Executive: Leading HR Executives on Developing a Personal Management Style, Overcoming Challenges, and Understanding Key Business,” a book published in 2008 with contributions by Margaretta Noonan, founder of noonanWorks. noonanWorks is happy to announce a new alliance with Agamie, a company that accelerates customers in the creation of strategy, design and execution to drive sustainable value. In this post, Margaretta Noonan, founder of noonanWorks, discusses the new partnership. Gender Diversity: Is The Global Playing Field Leveling? Margaretta Noonan, founder of noonanWorks, joined 70 global leaders at the recent Colloquium on Global Diversity convened by GlobeWomen.org. While there, she moderated a panel on “Understanding and Managing Millennial Men Globally,” and in this post, she shares her key takeaways from the panel discussion and other presentations at the event. This is the eighth in a series of blog posts with content from “Achieving Success as an HR Executive: Leading HR Executives on Developing a Personal Management Style, Overcoming Challenges, and Understanding Key Business,” a book published in 2008 with contributions by Margaretta Noonan, founder of noonanWorks. Career success comes in many shapes and sizes, and Margaretta Noonan, founder of noonanWorks, has witnessed different versions of it. She explains what it will take to have more women seizing the avenue of entrepreneurship. This is the seventh in a series of blog posts with content from “Achieving Success as an HR Executive: Leading HR Executives on Developing a Personal Management Style, Overcoming Challenges, and Understanding Key Business,” a book published in 2008 with contributions by Margaretta Noonan, founder of noonanWorks. This is the sixth in a series of blog posts with content from “Achieving Success as an HR Executive: Leading HR Executives on Developing a Personal Management Style, Overcoming Challenges, and Understanding Key Business,” a book published in 2008 with contributions by Margaretta Noonan, founder of noonanWorks. This is the fifth in a series of blog posts with content from “Achieving Success as an HR Executive: Leading HR Executives on Developing a Personal Management Style, Overcoming Challenges, and Understanding Key Business,” a book published in 2008 with contributions by Margaretta Noonan, founder of noonanWorks. This is the fourth in a series of blog posts with content from “Achieving Success as an HR Executive: Leading HR Executives on Developing a Personal Management Style, Overcoming Challenges, and Understanding Key Business,” a book published in 2008 with contributions by Margaretta Noonan, founder of noonanWorks. This is the third in a series of blog posts with content from “Achieving Success as an HR Executive: Leading HR Executives on Developing a Personal Management Style, Overcoming Challenges, and Understanding Key Business,” a book published in 2008 with contributions by Margaretta Noonan, founder of noonanWorks. This is the second in a series of blog posts with content from “Achieving Success as an HR Executive: Leading HR Executives on Developing a Personal Management Style, Overcoming Challenges, and Understanding Key Business,” a book published in 2008 with contributions by Margaretta Noonan, founder of noonanWorks. In 2008, Margaretta Noonan, founder of noonanWorks, contributed to the book, “Achieving Success as an HR Executive: Leading HR Executives on Developing a Personal Management Style, Overcoming Challenges, and Understanding Key Business.” Much of the content she had written is still relevant to HR best practices today. This is the first in a series of blog posts with content from the book. The Challenge: A mid-sized B2B company has occasional, high-level HR issues but doesn’t need a full-time senior HR person on staff. Learn how noonanWorks helped. “Mentoring Matters” is an ongoing series of articles featuring questions from BIZCATALYST 360° readers. Margaretta Noonan, founder of noonanWorks, serves on the Masterminds Panel, and in her most recent response, she writes about breaking into the HR world. During a recent trip in Washington, D.C., Margaretta Noonan, founder of noonanWorks, found herself complaining about navigating the city. In response, her friend said, “It’s easy once you understand the system.” This concept also applies to new employees entering unfamiliar organizations. What are you doing to help those employees? What are you not doing – that maybe you should be? As a Mastermind panel member for BIZCATALYST 360°, Margaretta Noonan, founder of noonanWorks, answers questions submitted by professionals facing business and career challenges. Most recently, she responded to a question on how to get past the “gatekeepers” in a job search. The Challenge: The new chief human resources officer at a mid-sized outsourcing firm was challenged by her CEO and board to transform the company into an “employer of choice.” The new CHRO was “drinking from a fire hose” from the day she walked in: multiple, urgent priorities with tight deadlines, a team not aligned with the various business areas, a private equity investor with an intense desire to get things in place fast – with minimal expense. Learn how noonanWorks helped. Yahoo CEO Marissa Mayer is in the news again, this time for instituting an evalutaion system that has apparently resulted in more than 600 employees being fired. While many employees, as well as those in the general public, are outraged by the bell curve ranking system, Margaretta Noonan, founder of noonanWorks, offers a different point of view. A recent New York Times article on body image and plastic surgery in Venezuela reminded Margaretta Noonan, founder of noonanWorks, about an article she wrote for BIZCATALYST 360°. Our standards of beauty are impossible to reach, and it affects the self-esteem and confidence of the young women in our lives. For Margaretta Noonan, founder of noonanWorks, October was a month centered around one topic: succession planning. Unfortunately, succession planning often winds up being a tactical response, rather than a carefully executed strategy. It’s a volatile world, and providing continuity in key positions helps ensure the ongoing success of an organization in turbulent times. In her second post on leadership transition and harnessing the power of disruption, Margaretta Noonan, founder of noonanWorks, shares tactical applications to take the inevitable disruption created by a change in leadership and use it to transform the company in an energizing way. At the latest Global Summit of Women in Kuala Lumpur, Margaretta Noonan, founder of noonanWorks, and more than 1,000 women from 72 countries discussed many topics affecting women today, including the representation of women on corporate boards, reducing workplace stress, social entrepreneurship, innovating business through technology, how to engage men in diversity efforts, and the theme of this year’s event, the essential role of women in the new economy. All organizations should have talent strategies in place for things like leadership development and succession planning, no matter their size or budget. In this post, Margaretta Noonan, founder of noonanWorks, shares her experience from a recent workshop event in Rhode Island, where she spoke with professionals from small companies and non-profits on using talent resources to optimize the capacity of their organizations to serve the community. A change of leadership is arguably one of the most important and risky moments in the life cycle of an organization – and it will inevitably cause disruption. Margaretta Noonan, founder of noonanWorks, shares the strategy behind harnessing disruption to drive the goals of a revitalized organization and help the new leader build a platform of success. In her many years of speaking at conferences and events, Margaretta Noonan, founder of noonanWorks, often has an audience comprised of mostly women. However, at her latest speakership, hosted by the Columbus McKinnon Corporation, the audience was more than 90 percent male. No matter the audience, though, her messages about succession planning remain the same. Too often, executives get bogged down in HR processes that require lots of forms, endless meetings and multi-level reviews. Margaretta Noonan, founder of noonanWorks, shares what managers should really be focusing on to maximize capabilities and create remarkable organizations. The gender pay gap is an issue that affects women worldwide, and while it has narrowed in the past 50 years, it is far from closed. In this post, Margaretta Noonan, founder of noonanWorks, and Linda Hallman, executive director and CEO of the American Association of University Women, share three steps they feel women entrepreneurs and business leaders can take to improve the rate of change. The Challenge: This established company suffered greatly during the recession and executed several rounds of layoffs. When business returned, it needed to restructure the firm for the future. Learn how noonanWorks helped. While true gender equality is far from a reality, we’re fortunate to be living in a time when there is an abundance of conferences dedicated to bringing women together to explore options and opportunities. Margaretta Noonan, founder of noonanWorks, has been attending the Global Summit of Women since 2002, traveling to Africa, Asia, Europe and the Americas, to stay briefed on women-specific issues, tune up her own professional development and keep in touch with a global network of fascinating women. Next up: the 2013 summit in Kuala Lumpur in June. Making the business case for diversity and inclusion has been at the top of the agenda for diversity professionals for years. Margaretta Noonan, founder of noonanWorks, and C. Evan Smith, senior partner at Schaffer Consulting, ask, “Once the case is made, and your CEO is on board, how can you effectively deliver the results you promised?" Entrepreneurship provides people – particularly women – a different avenue to explore career success. In this video, Margaretta Noonan, entrepreneur and founder of noonanWorks, explains the three Cs to help women take this step: confidence, capital and collaboration. The Challenge: This profitable agency had been paying discretionary quarterly cash bonuses. The founder wanted a way to make these bonuses more objective and tied to key achievements of the agency and its employees. Learn how noonanWorks helped. On the heels of the announcement by Yahoo CEO Marissa Mayer that employees will no longer be able to telecommute, many professionals, bloggers and everyone in between gave their opinions on the matter. In this post, Margaretta Noonan, founder of noonanWorks, questions not only whether this change is for good or ill – for Yahoo, for women, for workers, for businesses – but also, what led Mayer to make this change. What was she thinking? Margaretta Noonan, founder of noonanWorks, has spent 30 years in corporate jobs. In this post, she shares two truths she’s realized in those years: everyone needs someone to talk to, and the higher up you are in an organization, the harder it is to find the right someone. Who are you talking to? The Challenge: While this firm had grown to a size where an internal human resources director was desired, the CEO was uncertain as to which skills and attributes would be necessary in a successful candidate. Learn how noonanWorks helped. When a company acquires another, it is crucial for human resources to pay a great deal of attention to the integration, in order to see the results they expect. But the sad truth is that a lot of companies treat the human resources aspects of merger integrations the same way: they throw a lot of money down the drain and then wonder why they’re miserable. Margaretta Noonan, founder of noonanWorks, has participated in more than 100 acquisitions during the course of her corporate career and now serves as a consultant for companies during this process. In this post, she shares her steps for a successful integration. In the minds of many professionals, the typical career progression is viewed as a ladder, where one rung is higher than the other. But in this model, if you’re not going up, you’re not progressing. Margaretta Noonan, founder of noonanWorks, suggests that more professionals should consider another approach when it comes to career development: the flower model. Enough! Stop Asking, "Can I Have It All?" “Having it all” simply isn’t an attainable goal. In this video, Margaretta Noonan, founder of noonanWorks, advises that men and women alike should stop thinking about “all” and start thinking about “enough” when it comes to professional and personal success. Create A Culture So Staff Says,"I Really Want To Be Here!" While there are many employee retention practices, like recognition, flexibility and continued learning, many times these alone just aren’t enough. According to Margaretta Noonan, founder of noonanWorks, what matters much more is the relationship between an employee and his or her manager. That’s where a company’s “I really want to be here!” culture is made or broken. The Challenge: This startup company had exploded from a handful of people to almost three dozen – and was growing fast. Because there had been no effort to articulate a culture, there was confusion and a lack of engagement among the staff – they didn't understand the big picture about how their work made a difference. Learn how noonanWorks helped. Most workplaces today are a mix of four generations: “mature” people nearing retirement, “baby boomers” in key leadership positions, “gen Xers” moving up into management and “millennials” just entering the workforce. These generations approach work and the workplace with very different expectations. Margaretta Noonan, founder of noonanWorks, offers a solution to help workers connect across generations through the Connecting to a Changing Workforce program. Inviting employees to share their thoughts on the workplace will help make the overall work experience and culture better. The same methods – surveys, focus groups, third-party interviews, etc. – may not work for all companies, but there are several key factors that all executives should follow when seeking useful feedback. Margaretta Noonan, founder of noonanWorks, shares them here. What makes up a company’s culture? Is it just the vision, mission and values? Something more? What’s most important? In this post, Margaretta Noonan, founder of noonanWorks, answers these questions and gives her take on what makes a remarkable company culture.